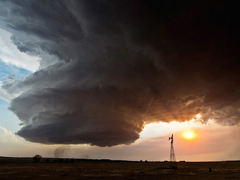 One of Camille Seaman’s beautiful images of storm clouds. Today’s TED Weekends on the Huffington Post asks us to, like Seaman, embrace nature’s wrath. Below, find an essay from Seaman herself, with spectacular photos included, plus other essays from HuffPo bloggers on the inspiring and intimidating power of nature. What does it mean to be a good ancestor? What does it mean to be a citizen of Earth? I ask myself these questions often. I am an Earthling. Growing up as a child of a mixed-race marriage, I did not fit in any of the boxes people seemed to want to place me in. I found the only category I felt comfortable in was as Earthling. Through all my adventures and travels around the world, I have come to know that we are all connected no matter how many lines, borders, languages, divisions we try to create. In the end we are all on this planet together. Our bodies are made of the material of this place. Doesn’t everyone have childhood memories, most of them very personal, about raging thunderstorms, especially when they are happening at night? Camille Seaman’s breathtaking photographs of what happens when the heavens announce, “Something Wicked This Way Comes” take me back to my nursery school years, hunkered down in my little bed, terrified of the banging, flashing and rushing noises that precede a major storm. About then, my parents would be counting down the seconds until they heard the pitter-patter of little feet charging down the hallway. It would be off with the covers, run down the hall, and reach for the doorknob of mom and dad’s bedroom. I’d instantly be snuggled between them, no longer fearful but intrigued by Mother Nature’s wrath. Not until my dad explained that these noises were actually caused by God practicing his bowling, could I accept the ferociousness of strong winds, earth-shaking claps of thunder and flashes of blindingly bright lightning. Nature has always had the power to awe us. From blue whales and mountains majesty to the infinite geometric arrays of microscopic lace that are snowflakes, there is no end. But I can remember seeing my first picture online of a supercell, and experiencing something beyond awe — shock. I was contemplating the Photoshopping that had gone into making the image, such was my doubt that something so close and overwhelming could exist on this planet. This was not a Hubble space photo of a distant nebula, a dark giant beauty existing “safely” millions of light-years away. This was a jinn hovering over an otherwise familiar sky. It could, in theory, hover over me. Never underestimate the power of an image to connect people to the natural world. Clouds are amazing. I know. I’ve been studying them off and on for the past 40 years or so. And as a scientist, I am continually stunned and just a wee bit overwhelmed by the array of physical processes that come together in time and space to form clouds. Clouds with their myriad shapes and hues, some peacefully billowing in a bright blue background and others dark and gray and capable of unleashing destructive forces that can blow a house to smithereens or inundate a city with a torrent of water.